PDF is a commonly used format for our official documents. Therefore, nowadays it’s a quite important skill to handle with PDF files, such as create pdf with doc, combine and merge pdf files as a single pdf, split a pdf into several pdf files, add password to pdf files for safe distributions, and so on. The essential part to get the skills we mentioned above is to find out a simple yet powerful PDF tool. In this article, we are going to introduce the best PDF Merger in 2018 – PDFMate PDF Converter Professional and show you how to apply the program to integrate multiple pdf files to a single pdf step by step. PDFMate PDF Converter Professional is an all-in-one PDF tool. 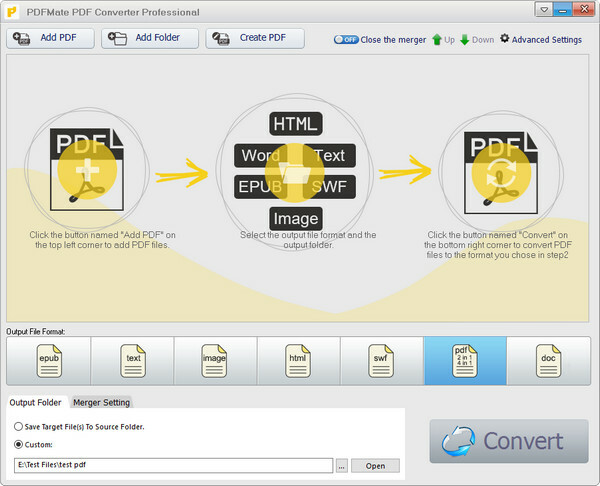 Firstly, it’s a PDF Converter that can help convert pdf files to other formats, including EPUB, DOC, TXT, HTML, IMG, SWF. Secondly, it’s a well-known PDF Merger that can help merge multiple pdf documents to a single pdf file at fast speed. Thirdly, it’s a PDF Splitter that can help break a large pdf into several new pdf files by specifying page ranges in a single go. In addition, it’s a popular program for password-protecting pdf files. Now let’s take a quick look at the program and learn how to apply the program to combine and merge pdf files. Though PDFMate PDF Converter Professional is a multi-functional PDF tool, it’s a user-friendly program with a quite simple and concise interface. - Create PDF with IMG, Word, Excel and PPT. 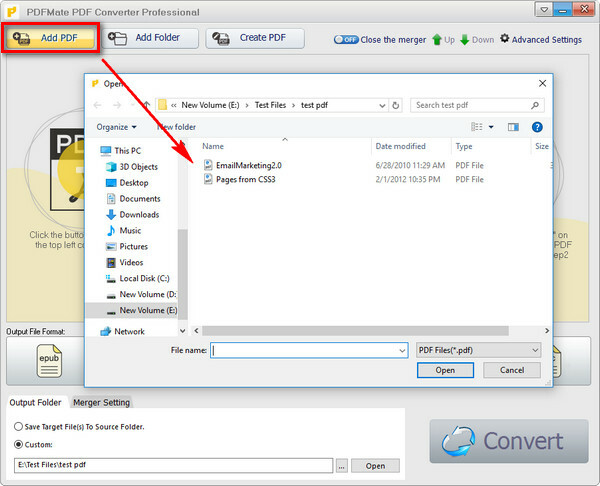 Below is a detailed guide on how to integrate multiple PDF files to a single PDF with PDFMate PDF Converter Professional. Click "Add PDF" button on the upper left. There will be a pop-up window allowing you to browse and upload the PDF files that you want to combine and merge together. Click on the output format that you want to save the merged pdf file as (EPUB, TEXT, IMAGE, HTML, SWF, PDF, WORD). Here we choose PDF as the output format. On the bottom, you can customize the output path for the targeted combined pdf file. Click “Output Folder” button and then click “…” icon to choose the folder that you want the merged new file to be saved in. Click “OFF” button besides “Close the Merger” on the top to turn the Merger on. 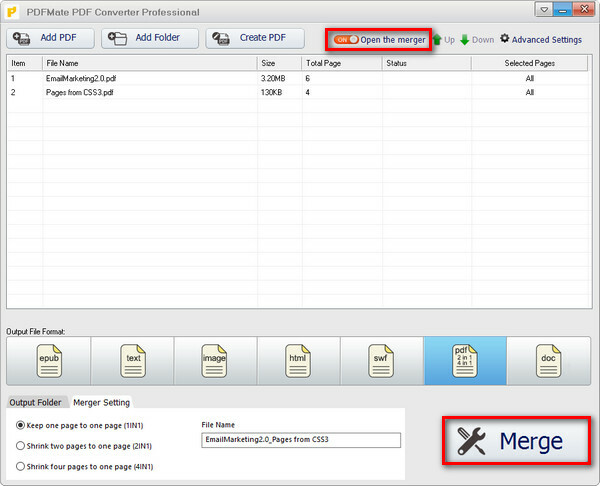 Then click “Merge” button, and PDFMate will automatically merge your pdf files in a few seconds. Note: You can customize the output file name by manually inputting the name in the "File Name" box. Go to the output path you set in Step 2 and you can find the merged PDF file ready for you. One of the factors to balance whether a program is an excellent one is whether the software provides users with good after-sale service. PDFMate offers life-long free updates and prompt customer service. Should we encounter any problem when using the program, we can contact PDFMate support team at support [at] pdfmate.com (replace [at] with @ before sending e-mail) for help. PDFMate PDF Converter Professional is an ideal PDF Merger with free additional functions if you are looking for a software to combine and merge multiple pdf files together as one pdf document. The only downside of it is that it’s a shareware instead of a free program. We advise you download the free trial version first and then decide whether you want to apply the program to deal with your PDF documents with one time purchase at $39.95 but life-long free updates and technical support.